Yesterday I had an interesting conversation with my fiance. We were talking about history and who writes it, about movements and who starts them, about know facts and who spread them. The sad truth we were aware of and have said out loud to each other is that history is written by those who won, by those who have the money to spread the news, to buy stands and become viral. This last point gave me hope though. Today money is not needed anymore to become viral. All you need is an internet connection. We need to start using those internet connections. That’s why I love World Pulse, it gives us the chance to share and learn which is what women should be doing. Given my origins, I have a particular thing for African women, but this counts for every woman out there, for every young person, for every man who thinks has nothing to give to the world, has nothing to do with his life. We need to make our time here count. I started studying journalism years ago because I thought I would have learnt and helped people. I did learn and helped. Two years ago I started a project, (IN)VISIBLE CITIES, a documentary that narrates the lives of African communities around the world so that people would stop having prejudices. It slowly works, especially in the minds of young people. But it works slowly and in my capacity I’m not able to help as many people as I wish. Last year I met the bravest woman I ever met in my life. She was my sister age, living in Turkey with a child left in Africa and another arriving. No documents. No chance to go back to Africa. No future for a job in Turkey. And yet, her resiliency kept her going. They call her “Mama” because she has the largest shoulders in her community, she is the one cooking for everyone and earning a bit from it. The one speaking Turkish, the one to do the shopping. I want to help. Since I left Turkey I’ve been meaning to help her but have largely been unsuccessful so far. She wishes to go back to Africa and starts a plastic material business for women living in her country and I don’t know the first thing about how to support her idea and help her realise her dreams. I went into journalism hoping I would have learnt and helped. And then I realised you don’t need a profession to do that, you don’t need a newsroom to do that. What convinced me to take advantage of all the opportunities I encounters is a statement Nobel Price Prize Winner Leymah Gbowee said during her TEDTalk. She quoted a Liberian woman saying: “I wish to be educated, but if I can’t I’ll be happy to see other women like me being able to do it.” I don’t consider me to be “like her”, my level of comfort is far greater but I am another young African woman plunging her nails into earth to make a difference. We should all try. I know you are. You have beautiful thoughts. We are more alike than it may seem. I strive to encourage people to push past their doubts and insecurities – one because I know those limits don’t exist and, two, it reminds me of the power in us all. I know you wish to help the African woman now in Turkey, but I believe she’ll be just fine. We cannot pursue dreams for others – they must find their strength within and do it themselves. By merely speaking with this woman, you may have already helped her. Sometimes, you can only cheer from the sidelines. The best advice I have is to never forget her story (which sounds like you won’t) and lend your ear whenever possible. But don’t underestimate your influence. 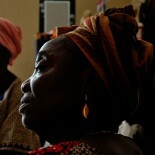 You are a burgeoning light to African women around the world. I wish to ler you know how much I appreciate your words, they really help. hopefully you’ll be right and my friend in Istanbul will actually realise her dreams, I reallu wish I controbute to it. This entry was posted on 16 January 2015 by Ngalula Beatrice Kabutakapua in Comment, Ethnic Minorities, Women and tagged african education, African women, istanbul migrants, Leymah Gbowee, nobel pr, nobel prize, raise your voice, women empowerment, world pulse, young girls education.